Fabian Cancellara isn't the only rider who is receiving early offers to head to a new team before his contract runs out. Omega Pharma's talented Frenchman, Jean Christophe Peraud, has expressed his desire to return to his homeland to race for a French team in 2011, and he's not the only one that wants to see the former mountain biker return to France. Unsurprisingly, the top French teams are highly interested in a rider able to contend on the general classification at the major stage races. Unfortunately for both Peraud and the French teams interested in his signature, Peraud still has one more year remaining on his contract with Marc Sergeant's Omega Pharma-Lotto team. Speaking to L'Equipe, Omega Pharma director, Marc Sergeant, was not keen on the idea at all. "I think he is widely sought after by many French teams, and it's very easy to see why. I do not see how he an leave though with one year still remaining on his contract. We were the first to sign him. He signed the contract." Peraud, a silver medalist in the cross country mountain bike race at the Olympics in 2008, surprised many with the win in the 2009 French time trial championships. 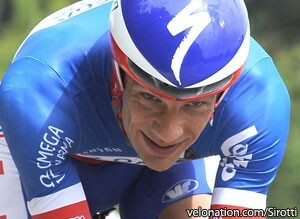 His performance there led to a two-year deal with Omega Pharma-Lotto. His season started out impressively with a 9th overall at Paris-Nice followed by 4th overall at the Vuelta al Pais Vasco. After that, things took a turn for the worse though, and the 33 year old missed his Tour de France debut due to blood poisoning. Though he wasn't able to take part in the lap around his own country, Peraud recovered sufficiently to start in the year's final Grand Tour, the Vuelta. He currently sits 16th on the GC after fourteen stages, 4:59 in arrears of new race leader, Vincenzo Nibali. Peraud nearly took the leader's red jersey after a great effort in the breakaway. He ended up finishing 7th on the day and came within 52 seconds of securing the overall lead.